The delivery of purposeful, inclusive, pro-active and transformative engagement processes enhance the responsiveness of governance systems and support the achievement of the 2030 Agenda for Sustainable Development. 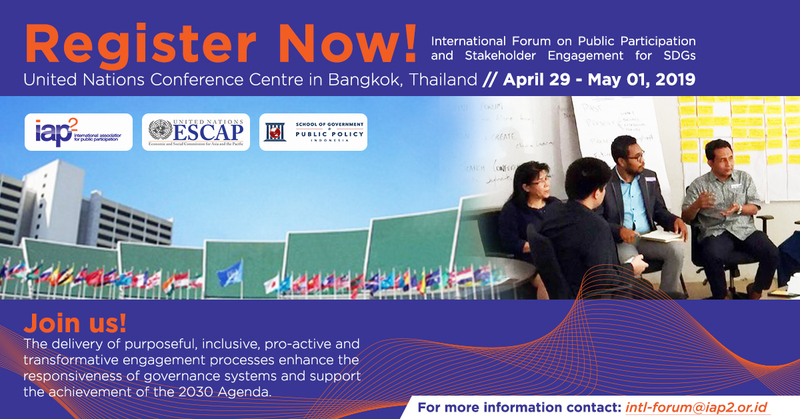 The event will also share the insights of the UNESCAP and IAP2 partnership. It will be followed up by a partnership dialogue to explore means of expanding partnership and support for governments, based on discussion in the workshop. Registration will be open until April 10, 2019.
International Association for Public Participation (IAP2) is an international leader in public participation which has developed the Core Values for Public Participation for use in the development and implementation of public participation processes. IAP2 offer professional development, training, networking events, a world-class conference, leadership forum and the annual Core Values Awards which acknowledge the leading engagement projects around the world. Currently we have more than 5,000 members from 6 affiliates: Canada, USA, Australasia, Italy, South Africa and Indonesia.